Yellow Brick Road is a two-pitch direct variation to Dream of Wild Turkeys. It is slightly harder, more sustained, and it avoids the hardest slabby cruxes and a long easy crack, and thus is an excellent variation for those climbing at the grade. Which SuperTopo guidebooks include a topo for Yellow Brick Road? By the time the Uriostes, with Mike Ward and Bill Bradley, began this route in the spring of 1985, they were experienced in leading long, bolt-protected first ascents. One challenge was simply having the hardware to adequately protect the routes. Doubts were already beginning to surface about the security of the 1/4” bolts that climbers had been relying on for anchors. Mike had a bad experience at about this time on Zodiac in Yosemite. The first move of that route was a hook leading to a 1/4” aid bolt. As soon as he weighted the bolt, it snapped, dropping him twenty feet to the ground. They continued and finished the route, but the experience was educational. Yellow Brick Road is a two-pitch variation to Dream of Wild Turkeys. Epinephrine ascends the ominous 600-foot-tall chimney. Over 1000 feet of amazing climbing on Black Velvet Wall. 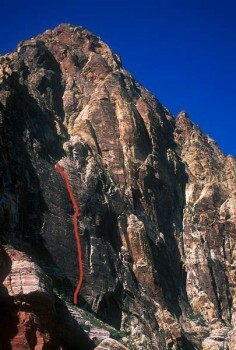 Prince of Darkness is a classic bolted face route up Black Velvet Wall. Sour Mash is an overlooked awesome varied climb. Overhanging Hangover ascends an intimidating and exposed roof.